What I love about the holidays is the opportunity to reunite with friends and at the same time gather with family to celebrate Christmas and to welcome the New Year as well. One of my favorite dining places is Tapella by Gaudi, I love that they are tucked in their own private corner in Greenbelt 5 and they serve delectable Spanish dishes by Executive Chef Robert Spakowski. Last week, I received an invitation from Tapella to come visit them again and try some of their new dishes on the menu and also to share with all of you what they have in store for their Christmas and New Year offerings. How can I say no? This salad is served with the freshest greens, and I loved that it had the right amount of balsamic dressing combined with the taste of sweet crunchy walnuts. It comes in a big serving too which can be shared by 3 to 4 people. It's my first time to try a cold soup dish and one with mango too, so it was pretty interesting. But, I loved it! Especially, when you have the soup with a bit of the crab and the salmon roe bursts open in your mouth and it releases that flavor. Yum! Who doesn't love sisig? Here's Tapella's take on that popular dish, but this time with fried shoe string potatoes at the bottom. The dish is very tasty and would be best to have with a happy drink (whether beer, sangria or wine perhaps). I wish you could scratch and sniff the screen so that you get a whiff of the aroma of the truffle infused on this pasta dish. It's now on my "favorite pasta dish" list. It's also served with fried prosciutto on top. You just have to try this! This is a light and healthy seafood meal. Every restaurant has a perfect dessert on the menu, and at Tapella, this is my favorite - the lava cake! It is served warm, moist and it melts in your mouth. It's the perfect dessert to end your meal. I wish they make bigger versions of this for a birthday cake. Alright, I know you're all planning reunions with friends and family gatherings this Christmas season and also to celebrate the coming of the New Year. Well friends, if you haven't booked a restaurant yet, Tapella has created the perfect food pairings for your group. 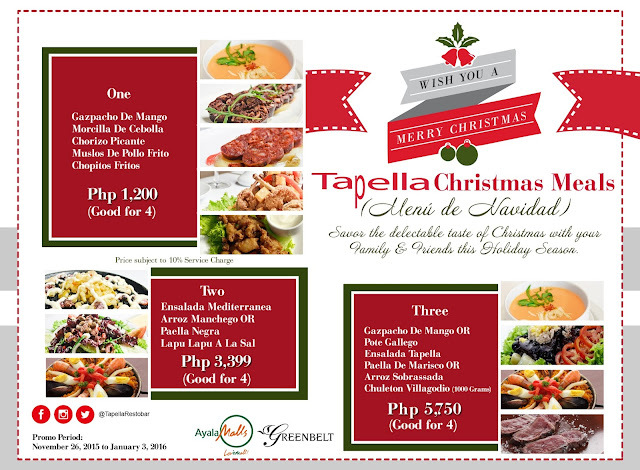 The Tapella Christmas Meals (Menu de Navidad) is available at Tapella until January 3, 2016. 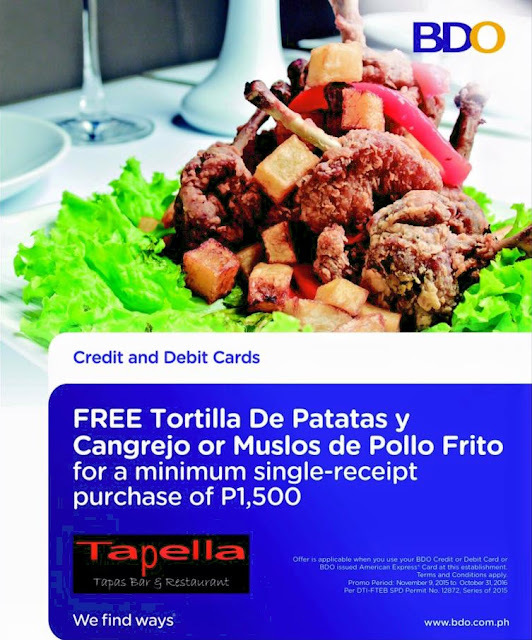 Also, you can use your BDO MasterCard Visa or any BDO Debit Card and avail of the FREE Tortilla De Patatas Y Cangrejo or Muslos De Pollo Frito for every Php 1,500 single receipt. 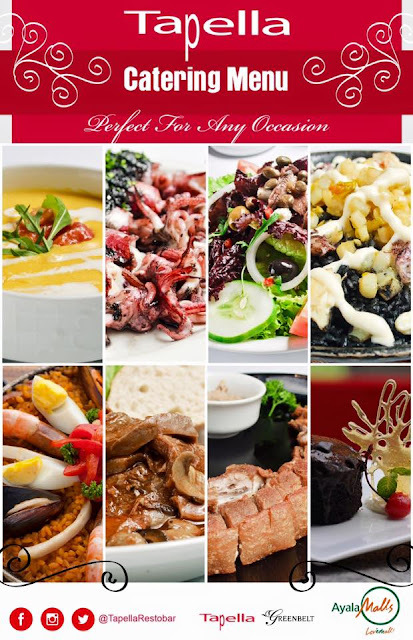 If you're planning to have your parties catered, at home or in an event place, Tapella has created a catering menu for your special celebrations and they can also customize for your celebrations as well. 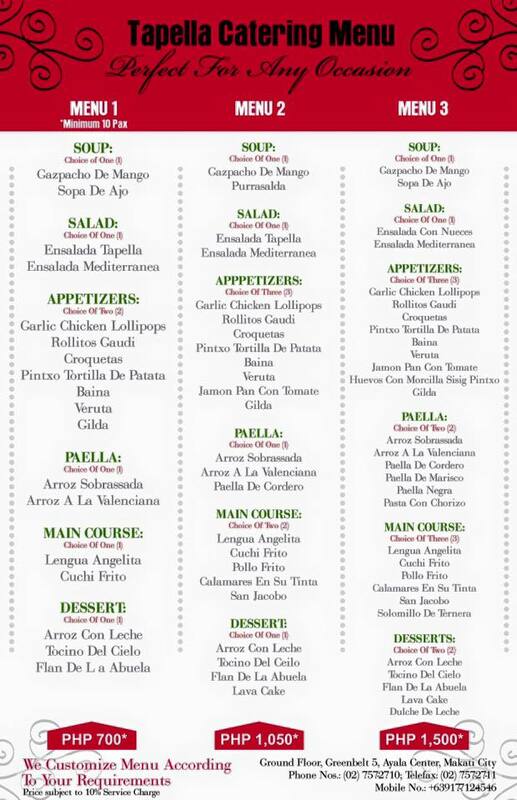 Fancy some Spanish cuisine for your celebrations? Visit Tapella by Gaudi at Level 1, Greenbelt 5, Ayala Center Makati City. For reservations or inquiries, call 757-2710 or send an SMS to 09177124546. For updates, follow Tapella by Gaudi on Instagram @TapellaRestoBar and on Facebook @TapellabyGaudi.